When Rose Benton left Texas five years ago, she carried a secret that tore her family apart. Now she's back to confront her brother, whose disastrous debts have endangered the family ranch. Faced with losing everything, Rose turns to the one man who can help—handsome, headstrong Trey Delaney, her late father's former right-hand man. With their adjoining ranches legally tied, Trey has only two choices: agree to Rose's plan, or lose his own birthright. Caught between hard luck and a desperate woman, Trey has a few tricks of his own in store for the neighbors who stole his land. The 1880's cattle country heats up when Trey and Rose unite to thwart her brother's scheme and save their land. In tough, protective Trey, Rose at last finds a man deserving of her trust. 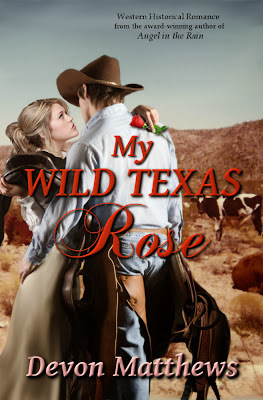 In Rose, Trey discovers a spirited woman with a heart as big as Texas. Can they heal old wounds and give in to the love both need... or will desire turn to dust when past betrayals are destined to repeat with a vengeance? Welcome! Come on in! If you enjoy Romance in the Wild West, you've landed in the right place. I'm Devon Matthews and I write Western Historical Romance. Kick off your boots and cool your heels while you have a look around the place. Thank you for stopping by. I hope you'll come back and visit real soon. If you would like to receive notice of new book releases, follow Devon on Amazon. Copyright 2013-2019 by Devon Matthews. Travel theme. Powered by Blogger.